FILE - Using rudimentary methods, small-scale farmers eke out a living in Gabon. A new study finds the rapid economic development in Africa may have serious social and environmental consequences. Huge investment projects are speeding ahead to address the urgency to expand agricultural production to feed a population that is expected to nearly quadruple this century. At the same time the continent is opening up to extensive mining, largely driven by foreign money. No overall plan or strategy exists to coordinate the many players, both foreign and domestic. “These gigantic proposals will create roads, pipelines, highways, railways and port facilities,” says William Laurance, director of the Centre for Tropical Environmental and Sustainability Science at James Cook University in Cairns, Australia. “These development corridors are going to penetrate into remote regions of Africa,” he added. In the study published in the journal Current Biology Laurance and his team assessed 33 major projects, all either proposed or in early stages. Massive development corridors cut through the African landscape, Aug. 11, 2012. “The corridors – each between 1,000 and 4,000 kilometers long - crisscross the continent like a spider web laid over the continent,” Laurance said. 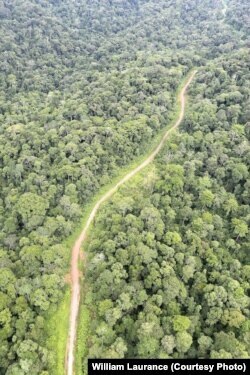 “Another six would slice into the heart of some of the most environmentally sensitive areas of Africa such as the Congo Basin and West African forest and critical equatorial and south equatorial forests of East Africa,” Laurance says. “These places are amazingly rich in wildlife and environmental resources.” Those projects should be canceled altogether. The remainder fit somewhere in the middle. Laurance advises caution moving forward. He says what may appear to be a great deal upfront, may turn out to yield unintended consequences. Take, for example, a large mining operation in which “limited numbers of people get really wealthy,” Laurance said. Laurance calls for local and national studies that can direct governments to deploy mitigation measures, - environmental safeguards that will assure a more positive future. 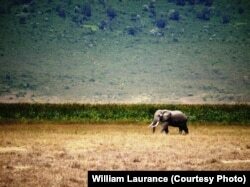 FILE - The African Savannah could suffer from wide-scale development. “It’s in nobody’s interest, not in the developing countries, the industrialized nations to have boom and bust development that results in catastrophic environmental loss and out right devastation of environmental resources,” Laurance said. Laurance says the time to act is now, before the projects gain a momentum that will be impossible to slow.